Navigating the fractious currents of émigré politics is never easy, and especially for the Iranian opposition group known as the Mujahedeen-e Khalq or the People's Mujahedeen of Iran. Simply put, the rogue oil state regime it opposes terrifies one half the West and tempts the other, and the MEK is itself accused of being a superannuated Marxist-Islamist terrorist cult. These obstacles have not, however, prevented the MEK from trumpeting Islamism as the new global threat, providing important intelligence to the West – for example, about Iran's nuclear program – terrifying the regime in Tehran, and putting on major displays of anti-regime solidarity. I witnessed one such display at a vast exposition hall outside Paris last week, where some 20,000 Iranians from around the world met to hear music from the old country, wave flags and banners, and listen to brief speeches by non-Iranian well-wishers – notably U.S. Congressman Bob Filner, Democrat of California, and former Algerian prime minister Sid Ahmad Ghozali. The crowd then settled in for an 85-minute tour d'horizon by the MEK leader, Maryam Rajavi. 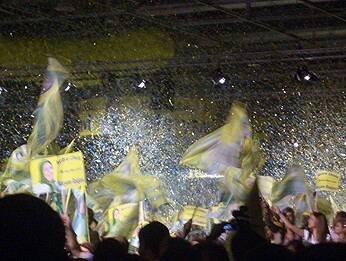 Second, the event had two apparent goals: reminding Iranians that an alternative does exist to today's theocracy, plus pressuring the European Union to remove the MEK from its terror list. For Iranians, the music portion included pretty girls in (for them, daring) Western clothing. For Europeans, it pointedly included "Le chant des partisans," the anthem of the French Resistance during World War II. Third, Rajavi's in-depth analysis mentioned neither the United States nor Israel, something extremely rare for a major speech about Middle Eastern politics. Nor did she even hint at conspiratorial thinking, a deeply welcome change for Iranian politics. Young singers at the Mujahedeen-e Khalq rally outside Paris on June 30. 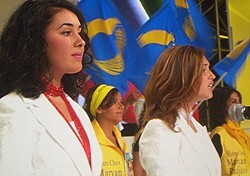 Many participants wore vests inscribed with the slogan, "Notre choix, Maryam Rajavi," an allusion to the MEK leader. These factors, combined with the mullah's near-phobic reaction toward the MEK, suggest that the organization presents a formidable tool for intimidating Tehran. Alas, Westerners presently cannot work with the MEK, due to a 1997 decision by the Clinton administration, followed five years later by the European Union, to offer a sop to the mullahs and declare it a terrorist group, putting it officially on a par with the likes of Al-Qaeda, Hamas, and Hizbullah. A Portuguese member of the European parliament, Paulo Casaca, notes that "Officials on both sides of the Atlantic are on the record as saying that the only reason why the group was put on the U.S. terrorism list in the first place was to send a 'goodwill gesture' to the Iranian regime." But the MEK poses no danger to Americans or Europeans, and has not for decades. It does pose a danger to the malign, bellicose theocratic regime in Tehran. The MEK's utility to Western states is reflected in the inconsistent, even contradictory, U.S. government attitude toward it over the past decade. One amusing instance came in October 2003, when Colin Powell, the secretary of state, tartly wrote Donald Rumsfeld, then secretary of defense, to remind him that the 3,800 MEK forces at Camp Ashraf in Iraq were supposed to be treated as captives, not as allies. But there will be nothing amusing as the American presence in Iraq winds down and thousands of unarmed MEK members are left to the tender mercies of the pro-Tehran regime in Baghdad. Belatedly, the Bush administration needs to take three steps. First, let the MEK members leave Camp Ashraf in a humane and secure manner. Second, delist the organization from the terror rolls, unleashing it to challenge the Islamic Republic of Iran. Third, exploit that regime's inordinate fear of the MEK. As Patrick Clawson and I suggested over four years ago, "To deter the mullahs from taking hostile steps (supporting terrorism against coalition troops in Iraq, building nuclear weapons), it could prove highly effective to threaten U.S. meetings with the MEK or providing help for its anti-regime publicity campaign." That remains good advice, but there's not another four years to wait.